wig Description: How to wear? 1. Take wig out from the packing, give it a few good shakes to release the default style. 2. Remove earrings and comb your own hair to remove knots and tangles. 3. Wrap your own hair tightly into a high ponytail and wrap a hairband around it, then separate it into two ponytails which are pulled tightly. 4. Wrap it around the base of your own hair ponytail, and place your fingers in the middle of the wrap to pull the end piece of the ponytail into the wrap to create a knot. 5. Press down on the bun, using bobby pins into the hair to secure the bun and keep it close to the skull. 6. Put on a wig cap on your head, push all strands of your own hair that are on the side, the back, and front of your head, under the cap, to create a smooth surface. 7. Comb the wig gently, and pull the adjustable straps to accommodate your head snugly inside the wig. 8. 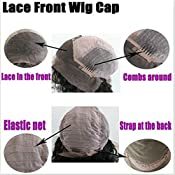 Hold the top and bottom part of the wig and pull it from the front of the head, then pull it back gently, adjust the wig to cover the cap and to fit perfectly around your head. 9. Pin the sides of the wig to the wig cap and to your own hair. 10. Finally comb the wig again on your head. 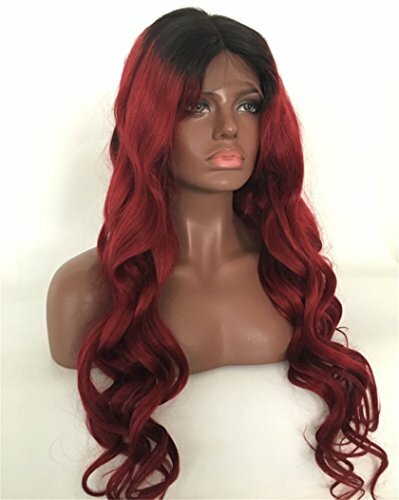 How to wash wig? 1. Soak the hair gently with mild conditioning shampoo in cold or warm water. 2. Rinse the hair in warm water towards to the same direction. 3. Brush the hair gently in a downward from top to end. 4. Lay flat the hair and leave it natural air dry. 1.Hair Grade : Unprocessed Brazilian Virgin Hair Wigs,130% density(150% 194% Need Extra Fee),Two Tone Omber color (Can be Dyed and Bleached By Yourself). 2.Lace Color:Medium Brown(Default),Dark Brown.19a Brazilian virgin human hair straight full lace wigs and lace front wigs. 4.RISK-FREE PURCHASE - We offer EVERY customer a 30-days money back guarantee. If you don't like our product, simply return it and get 100% of your investment back.